Take part in our local silent auction while you enjoy farm-fresh bites from our featured chefs of Novo Restaurant, Granada Bistro, Thai Bounty, and plant-based chef Angelica Peach. Their freshly prepared dishes will be paired with wines provided by Wild Horse, Opolo Vineyards, and Baileyana along with beverages by Whalebird Kombucha. We’ll also be serving SLO Almonds dessert treats. The festivities will be accompanied by live music from B and the Hive for your listening and dancing pleasure. So come out and be part of the happenings at City Farm SLO. Take a tour of new student gardens, outdoor kitchen, food forests, and more. If you cant make it to this event and would like to help support our programs, it’s easy here. Help us finish the new permanent field kitchen and prepare for A Taste of Spring, our gala Benefit coming up Saturday May 19. We’ll also be weeding, mulching and mowing as the garden fills with veggies and flowers. Help us refurbish the out door kitchen used by our school programs for the last four years with a new work counter, sink, and grey-water drainage system. Help us install 25 new native plants with gopher baskets and drip irrigation to attract beneficial insects, repel harmful ones and beautify the vegetable garden area. Help us set up a humane system for dealing with destructive groundsquirrels. Enjoy the spring beauty of the lawn planted last fall. Please join us for a glorious afternoon and evening in support of City Farm SLO. Tickets available now at https://atasteofspring.brownpapertickets.com Only a limited number are available. 4 chefs, 4 wineries, music by B and the Hive. February 10 2018, 9:00 a.m.
Join us for our Valentine’s month workday to help us lovingly plant new fruit trees & perennial crops in the food forest beds. In the food forest we’ll show how to combine bare root fruit trees with an understory of edible vines, herbs, flowers, and bulbs to create a no-till, year-round food production garden. We’ll also install drip irrigation, mulching, and gopher protection. Families (All ages) welcome, please bring gloves and a water bottle. Wear protective shoes, dress for varying winter weather (cold, wet, to full sun) and enjoy a day on the farm. and planted 600 winter crop vegetable seedlings donated by Greenheart Farms. 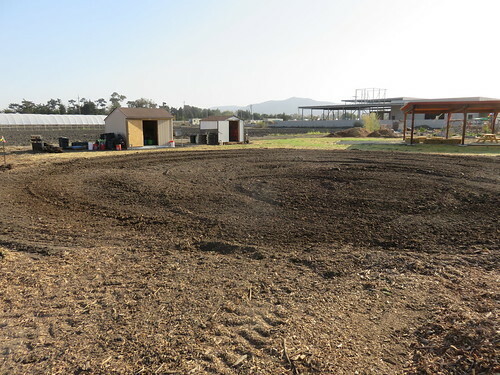 January 13, 2018 9:00 a.m.
Ring in the New Year by joining Friends of City Farm SLO in preparing our School Gardens for a new season. Saturday January 13 is the day for completing a deer fence around the perimeter of our newly designed and reconstructed activity space. It will protect cropland where students at Pacific Beach High School and the PREPARE program grow, cook and eat their own vegetables, the new food forest orchard and the beautiful pergola used for instruction and public events like our Fall Harvest Festival. In the last four years of these programs, deer (and some other mammals) have severely damaged the harvest by helping themselves to seedlings as well as mature crops. This event will stop that from happening. The posts will already be placed, but we need lots of help to attach rolls of fencing to them and hang several gates. If time permits, we’ll also be installing new irrigation. Instructions and supplies are supplied. 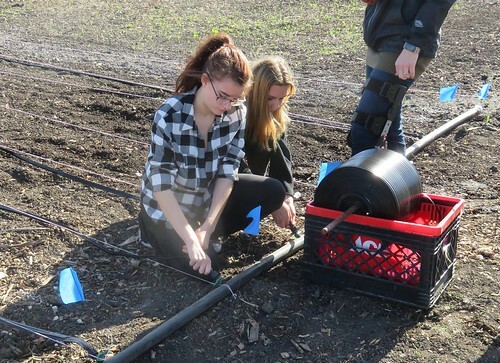 Join students and neighbors and learn some of the varied tasks and skills that it takes to maintain a small farm. Help keep up the momentum at City Farm’s ongoing improvement campaign, which has included soil preparation, weeding and sowing the now maturing cover crop. Farm-grown snacks are provided. Children welcome. 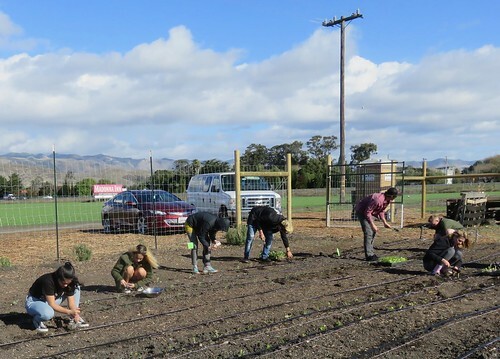 November 11, 2017 10:00 a.m.
Come join friends and neighbors in preparing City Farm SLO for Winter. We’ll be working the hard caked clay of uncovered areas surrounding the Student Garden and Pergola. 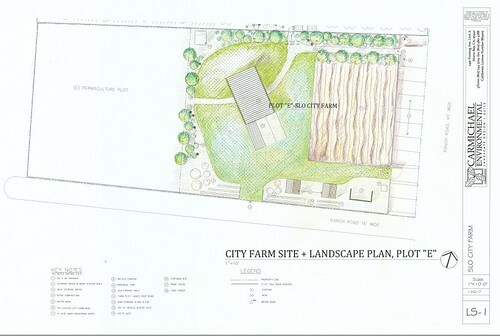 Tasks will include mowing and digging up weeds, watering, tilling the ground, sowing seed and mulching pathways. This work will promote soil health, beautify the landscape, and enhance fertility for future plantings and events. Tools and machines are provided. Wear sturdy shoes. Bring your own work gloves and water bottle. Be prepared for windy or cold weather and full sun. Pitch in and help maintain the momentum of the Fall Harvest Festival to make this a place to serve and enjoy.